Retinal vein occlusion (RVO) is a clinical disorder that occurs when the blood vessels in the retina become blocked, preventing blood flow and initiating a series of events that impair vision. RVO is a common complication to common health problems such as high blood pressure, high cholesterol, or diabetes, and is second only to diabetic retinopathy as the most common retinal vascular disorder. However, despite its prevalence, there are currently no optimal treatments for patients. The current standard of care for clinical treatment of RVO is intravitreal injections of anti-vascular endothelial growth factor (VEGF). However, while this therapy has improved outcomes for many patients, it requires frequent injectionse, and therefore is complicated by both negative secondary effects to the eye, and poor patient compliance. Therefore, there is a high demand for alternative therapies to treat RVO. 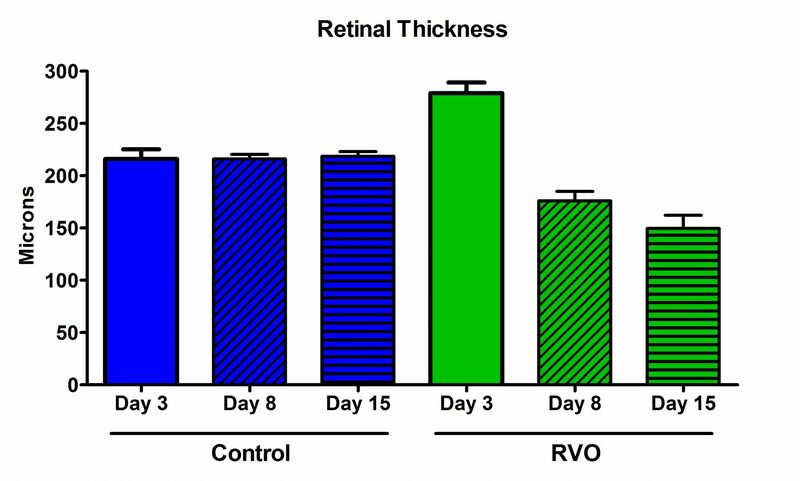 EyeCRO has validated a mouse model of RVO and designed experimental procedures to test therapeutic intervention on retinal degeneration in this model. In this model, venous injection of a photo-activator dye, Rose Bengal, is combined with laser treatment to allow for precise and robust thrombus formation and retinal vein occlusion. Following injection of the dye, a thermal laser is used to photocoagulate up to 3 different retinal veins in a single eye. Longitudinal retinal thickness in the area of occlusion is measured by optical coherence tomography (OCT) for up to 2 weeks following induction of RVO. Retinal vascular leakage can also be measured by means of in vivo fluorescein angiography (FA). Terminal analysis includes immunohistochemistry (IHC) to measure retinal cell death, and biochemical analysis of inflammation.